Imagine the twisted evil twins of Holmes and Watson and you have the dangerous duo of Prof. James Moriarty - wily, snake- like, fiercely intelligent, unpredictable - and Colonel Sebastian 'Basher' Moran - violent,politically incorrect, debauched. Together they run London crime, owning police and criminals alike. Unravelling mysteries -- all for their own gain. 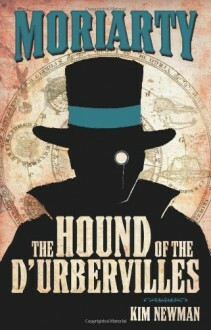 A spin-off from Titan's highly successful Further Adventures of Sherlock Holmes series, The Hound of the D'Urbervilles sees acclaimed novelist Kim Newman (Anno Dracula) take on the fiendish Professor Moriarty. Extremely disappointing. Characters are bland, stories meh and I didn't like the tone of the book. After I noticed how similar Dr Temple and Moran's voices are I shouldn't have accepted it to be enjoyable read.